Traditionally, Red Envelopes hold "lucky money" or small, precious gifts such as gold or jade jewelry. They are used to enhance luck, prosperity and happiness. Comes in a package of 3 envelopes with 3 coins ready to give away as gifts. 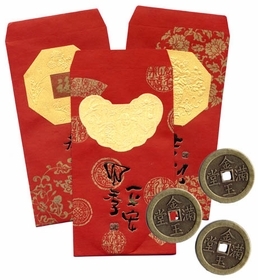 Used primarily during the New Year in China, they also work to bring prosperity all year round.